Windows 10 will reintroduce the much-missed Start menu. After offering a first look at its forthcoming operating system yesterday, Microsoft is giving users a chance to try out a version on their own machines. The Windows 10 preview will be available for download from Wednesday, October 1. The new operating system will be compatible not only with the PC but with a wide range of other devices including Xbox consoles, smartphones, tablets and even connected appliances. Microsoft also plans to offer a unified, cross-device apps platform. 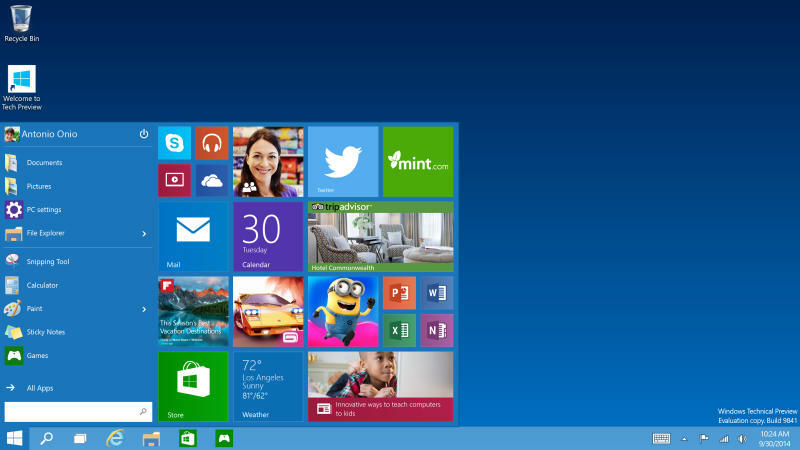 Windows 10 marks the return of the Start menu, which provides quick access to frequently used files and programs. The interface also includes a new area that users can customize with links to their favorite apps and websites. Another new feature is that Windows Store apps will now be opened in the same way as programs running on the desktop, meaning it will be possible to resize, move and collapse them using the upper navigation bar. Microsoft seeks to improve multi-tasking capabilities in this latest version of Windows, which will allow up to four apps to be open on the screen at once. Windows 10 also makes it easier for users to create two desktops (personal and/or professional) and to easily toggle between them. Microsoft has not announced the exact release date, but it is known that the final version of Windows 10 will not be available until spring 2015 at the earliest. The official Windows 10 preview will be available for download from October 1 at 12:00pm EDT.